Puffy is a Japanese female musical duo with a laid-back, down-to-earth style. Onuki Ami and Yoshimura Yumi, the members of Puffy, sing cheerful pop music with powerful vocals. Their 1996 debut single "Ajia no Junshin" became a million-seller, and they are popular with fans in their 20s and 30s. Hi Hi PUFFY AMIYUMI, a cartoon series starring these two singers, began airing in November 2004 on the Cartoon Network, the largest animation network in the United States, and earned record high viewer ratings for a new program. The show is a big hit right now among American kids. 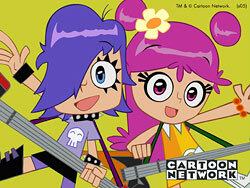 Hi Hi PUFFY AMIYUMI got its start when Cartoon Network producer Sam Register saw a Puffy music video, loved it, and decided to use the duo as the basis for a TV show. The cartoon's story unfolds in a slam-bang comedy exchange between the optimistic Ami and the cynical Yumi as they perform on tour. Each episode, the two Puffy members appear as themselves, singing and bantering in Japanese, which gives the show a real Japanese flavor. "The animated portion of the show is created in the US, but there are a lot of influences from Japanese anime [animation]. Unlike in the West, animation in Japan is enjoyed by everyone from children to adults. With such a huge market, the quality is really high. Right now, the people working on the cutting edge of American animation are those who grew up watching Japanese anime," said Mariko Hisamitsu of Japan's version of the Cartoon Network (broadcast on SKY PerfecTV! and CATV throughout Japan). The live-action portion of the show is filmed entirely in Japan, with the Japanese conversation adlibbed by Ami and Yumi. The duo's hair styles and street-casual dress are exactly the same as what they normally wear, and the program's soundtrack consists of a parade of past Puffy hits. Naturally, Japanese songs are also included. Ami and Yumi are having a great time making the shows, not changing one bit from their original style as they present themselves as "Puffy from Japan." Hi Hi PUFFY AMIYUMI has proved popular in the United States and is scheduled to be broadcast in Japan beginning in the summer of 2005. Japanese audiences will then be able to sample this new style of anime blending Japanese and American culture.